Dog muzzles are a controversial piece of training equipment, but they can be used for more than just aggression – just make sure you know what you're doing. It is a common misconception that muzzles are only used to keep aggressive dogs from biting. On the contrary, muzzles can be used for many different types of training, and they've been proven to be quite effective. Remember, a muzzle is not an acceptable alternative to socialization and proper training. if your dog is showing signs of aggression you need to work with a trained professional. 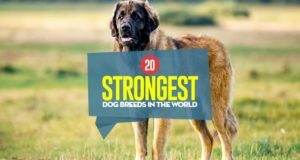 You should not be training an aggressive dog without experience. Muzzles have become known to many dog owners as inhumane, but that couldn't be farther from the truth. Muzzles can be used to protect your dog, yourself and other people around you while you're training. I decided to write my column this week on the many appropriate use of muzzles to try and dispel the negative images associated with these training tools. When can dog muzzles be used? I'm a firm believer that all dogs, no matter what their temperament may be, should be trained to wear a muzzle. Maybe you'll never need to use one, but if your dog is comfortable wearing one then you'll never have to worry. The reason that I say this is because no matter how well you know your canine companion, you never know what variables may play into any given situation. When a dog is scared, anxious or nervous – no matter what dog it is – his reaction is ALWAYS unpredictable. Maybe your dog has always been well-behaved during vet visits, but what if you need to get a new vet for some reason or your dog needs emergency treatment? Changing any of the variables of a vet visit gives way to the potential for an unpredictable response from the dog. If everyone knew exactly when and where there was going to bite someone, there would never be any dog bite cases making the local news. Oftentimes if a dog seems stressed the professional working with them – whether it be a trainer, groomer or veterinarian – will muzzle the pet for safety reasons. If your dog has experience wearing a muzzle, this won't be an issue. Along the same lines, a muzzle can be a great tool to use when training a reactive dog. If you're trying to work with your pet around other animals or new people, a muzzle will make things much easier. Dogs pick up on our emotions, and if you're nervous about your dog's reaction, he may become more stressed as a result. Using a muzzle during these types of training exercises will allow you to be more relaxed, which will have a calming effect on your dog as well. If something does go wrong and your dog reacts inappropriately, no one will get hurt. This will give you peace of mind so you can be focused 100% on the training experience. Traveling is also another instance when a muzzle will come in handy. Depending on the mode of transportation and where you are going, your dog may be required to be muzzled at certain times during your trip. If he's already used to wearing a muzzle this won't be a problem, even if you only travel with him once in a while. The first thing you'll need to know about shopping for dog muzzles is that there are two different types. Basket muzzles, also known as Greyhound muzzles, are bulkier. Traditionally they are made from plastic, metal or leather. These muzzles are sturdier and allow your dog to pant and eat treats or kibble that you feed him through the holes. For general purposes, this is the safest and most effective type of dog muzzle. They are also best for long-term wear, as your dog will be more comfortable wearing a basket muzzle. The other type of dog muzzle available is known as a soft-mesh muzzle. These are ideal for quick use, such as a trip to the vet. They are also much easier to travel with, as they fold up easily and can be kept in a pocket or purse. As you can see by the photo on the left, these muzzles keep your pet's muzzle almost completely closed. Obviously, this makes treating and panting impossible. For that reason, soft-mesh muzzles should only be worn for short periods of time. Gentle leads and head halters are not a suitable substitute for a muzzle. 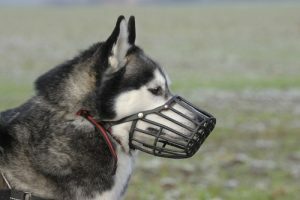 They are not intended for the same purposes as muzzles, and should only be used for dogs working on leash training. Dog muzzles can be scary and even a bit intimidating to even the most well-socialized pet. Training your dog to wear a muzzle will take time and patience. You'll need to start out very slowly, as you'll be working near the dog's mouth and you don't want him to scared and bite you. Here are some quick steps to train your dog to use a muzzle. If you have any doubt that your dog will be receptive to wearing a muzzle, it is best to work with a trained professional. It may cost a bit more money, but it will ensure your safety and the safety of your pet. Show your dog the muzzle and allow him plenty of time to sniff it and get used to the idea of the new object. Give him plenty of praise and treats when he gets close to the muzzle. Hold the muzzle in your hand and let the dog come to it. When he gets close, praise him and give him another treat. What you're trying to do is associate the muzzle with positive reinforcement right from the beginning, before you even put it on him. 5. Place a treat inside the muzzle and allow your dog to take it out himself. Do this multiple times until your pet is comfortable placing his nose inside. 6. If your dog is hesitant, try using a treat that can be licked off, such as peanut butter. 7. When you feel your dog is comfortable putting his face inside the muzzle, you can begin fastening the straps. Only fasten the muzzle for brief periods in the beginning – always praising and treating while the muzzle is on. Work your way up to longer periods of time, and eventually your pup will be a muzzle-wearing pro.